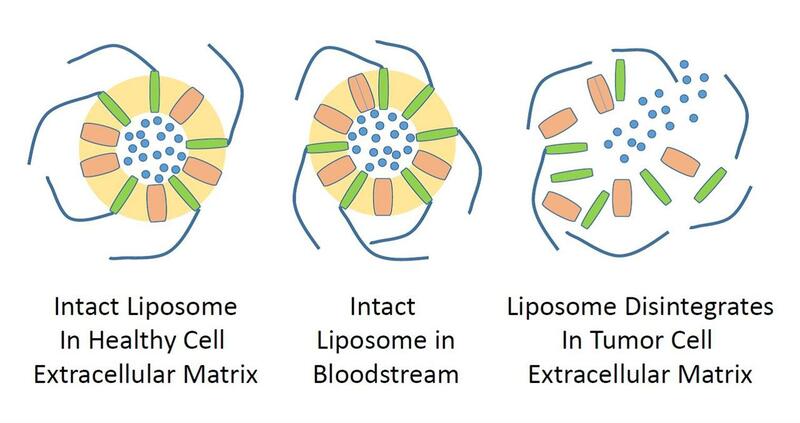 The liposome-based delivery system incorporates POPE-SS-PEG synthetic lipids which protect the liposome in circulation, but lead to rapid removal of the protective PEG molecules once the liposomes reach tumor ECM. Removal of PEG at the tumor exposes MMP-9 ‘trigger polypeptides’ that are cleaved by matrix metalloproteinase 9, also present at a high concentration in the tumor ECM. This releases the liposome contents within the tumor. The rapid removal of PEG and disintegration of the liposome in conditions found in the tumor ECM results is a high concentration of active ingredient available for uptake into the tumor cells, while minimizing non-target delivery and time spent in the bloodstream so side-effects are also reduced. This technology is the subject of issued US Patent No. 9,457,041 and is available for licensing/partnering opportunities.